I know a lady who has, in her place of business, a shoe drawer. Skilfully concealed amongst drawers containing the necessaries of her livelihood is a deep receptacle in which she stores shoes, thus enabling her to switch her footwear at a moment's notice to match her mood, duties or perhaps the weather as appropriate. I, on the other hand, have a somewhat negligible number of pairs of shoes and like a comfortably shod foot, in order to gad about in comfort as I seek out tales and gossip to present here at the Guide. 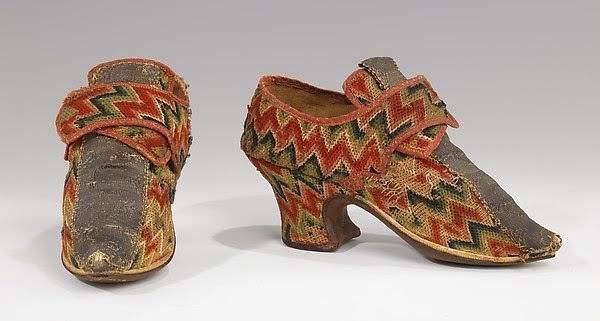 I am currently engaged in character notes on a rather flamboyant French gentleman who likes nothing better than a fine suit or a bright textile and it is through him that I have discovered these rather wonderful, colourful latchet shoes. Created in the first half of the 18th century, one can imagine how utterly dazzling they must have been in their day; indeed, they are hardly dull now, three centuries since a lady popped her feet into them and went off on the town. The geometric patterning to the shoes is achieved by an embroidery technique known as Bargello and this style in particular is a flame stitch. Bargello embroidery takes its name from the chairs on which it was first practised, which can be found in Florence's Bargello palace. Hugely popular in the early long 18th century, flame stitching was usually used for furniture or accessories and shoes like those we see here. Unusually, even the heel is embroidered whilst the strip of braid that runs up the centre would once have been dazzlingly metallic. From the condition of these shoes, in particular the embroidered heel, we can guess that they were hardly worn to tramp the streets of Georgian England but rather had a finer life... if only they could talk! They look quite comfortable for heeled shoes, except the pointy toes. I prefer sandals, but that would not have been an option in the Georgian era, so nice to know you could wear something comfortable. The heel isn't too high either, always a plus point! The needlepoint on these shoes is similar to the pattern my mother did for our dining room chairs. You must have a very talented mother, how wonderful! They're certainly rather gorgeous. How, please, do they fasten? Is there a buckle? Ties? There would be a buckle; hopefully an ornate one! I fear this may be an unanswerable question, but does anyone know if these shoes were made by a shoemaker on commission for a particular lady (of taste and discrimination!) or whether they were made 'on spec', as it were. You often see shoes of this period which are essentially heeled slippers, ie have no backs and so would fit a wider range of foot sizes. To be able to dance in these - even a stately minuet - they would have had to fit comfortably. And I bet the buckles were silver - or even jewel encrusted! Shoes for a heroine! Sadly I think the identity and provenance of the shoes has been lost over time. I have a suspicion, from the style and elaborate design, that these *were* made to order but that's nothing but speculation, I'm afraid. These shoes and others you've been showing lately are a joy,Catherine. I agree, these are not meant for excursions in dirty streets. They'd be perfect for an assignation or two, a la Fragonard!